1", 1 1/2", 1 1/4"
Satin, Rippled, White, Bright Brass, Almond, Peened and Other Colors. 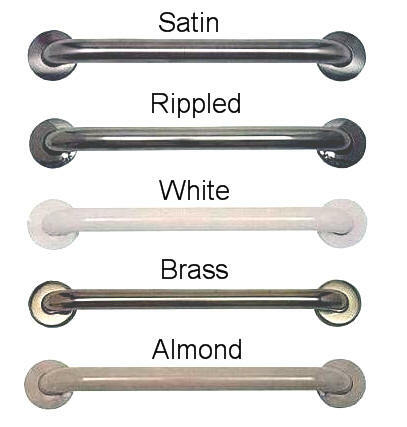 Grab Bars Are Available With Exposed or Concealed Screws. Cleans Easily, Resists Mold, Mildew and Bacteria Growth. Do you have a Fiberglass Shower or Fiberglass Tub enclosure? 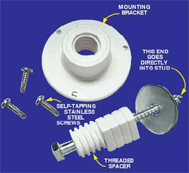 The Solid Mount Â™ is the one and only Patented fastening system designed specifically for installing grab bars into a Fiberglass Shower or Fiberglass Tub enclosure. Do you ever feel your Fiberglass Shower or Fiberglass Tub enclosure could be safer? Have you ever felt your feet slip in your Fiberglass Shower or Fiberglass Tub enclosure? Do you ever feel like you have nothing solid to hold onto, so you can balance yourself when you are in your Fiberglass Shower or Fiberglass Tub enclosure? Would you like something solid to hold on to as you enter and exit your Fiberglass Shower or Fiberglass Tub enclosure? 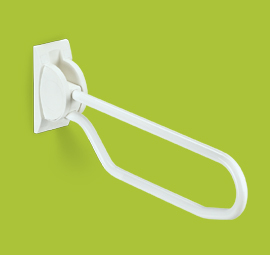 The Solid Mount Â™ is the solution for giving you a safe and secure shower or bathing experience. 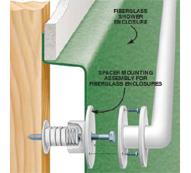 Fiberglass walls have no structural or stable support, not only will the fiberglass shower or fiberglass tub walls flex when pushed against but they also can crack and break over time from continual pushing or pulling. 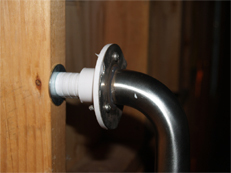 The Solid Mount Â™ allows a grab bar to be safely and securely installed into your Fiberglass Shower or Fiberglass Tub enclosure, The Solid Mount Â™ does not rely on the fiberglass of the shower or tub for any of its support or strength it gets all of its support and strength from the structural studs that are already part of the walls in your home. 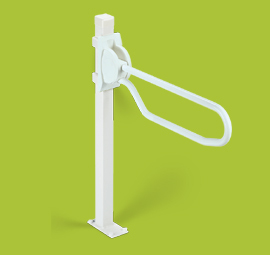 These Hinged Arm Supports are made of white coated steel. 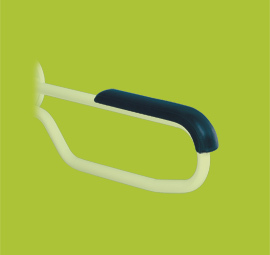 The supports lock automatically in upright position. 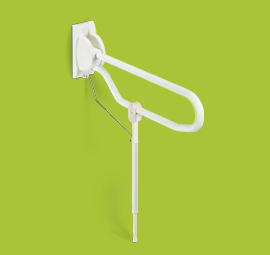 Arm support can be wall mounted or floor mounted with the stand. Floor mounted is recommended when there is no blocking in wall or when wall fixing is impossible or inconvenient. Arm Support is adjustable in height when used with Floor Stand. Weight limit 250lbs. ADA Compliant. 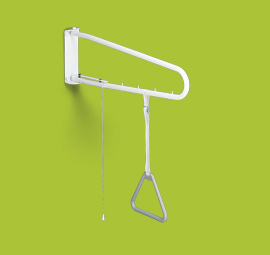 Arm supports and floor stands are also available in stainless steel bright finish. 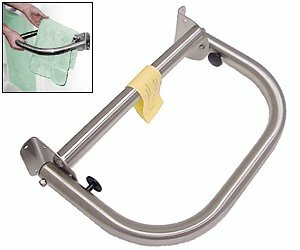 Grab Bar available in 23 3/4", 27 1/2" and 31 1/2"
Leg adjust from 27 1/2" to 31 1/2"
WE ALSO HAVE HINGED ARM SUPPORT ACCESSORIES! 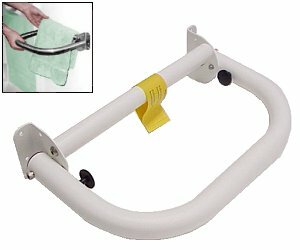 This grab bar is an excellent multi-purpose bars that provide a vertical arm and two horizontal supports for added stability. When entering tub, if the batherÂ’s right hand grips the vertical, specify right hand. If reverse, specify left. Choose from right or left hand models below. The above picture is the right hand model. Triple mount allows for exceptional stability. Offers support on all three walls of shower. Bar is custom fabricated to finish wall dimensions. The 483 has smooth, one-piece construction with no sleeves. The 483/C-70 is fabricated and shipped in components with sleeved mid-support covering joint connection. Each 483 is custom made to finish wall dimensions. Stainless Steel 1'' 1/2 diameter surface mounted bar utilizes the out riggers at the floor to stabilize. 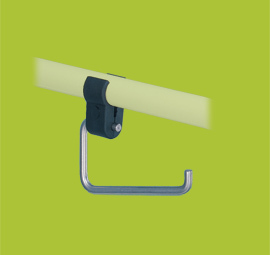 Out rigger is reversible to left or right position and is ADA approved.